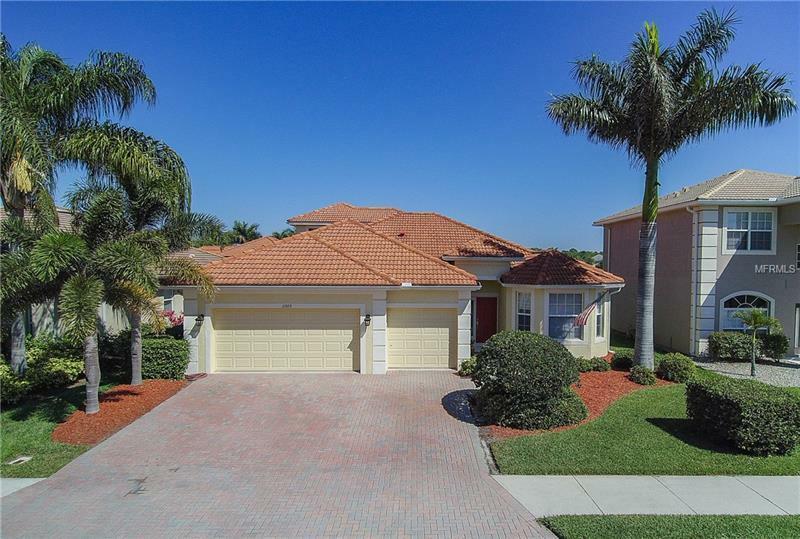 WELL MAINTAINED 4 BEDROOM, 2 AND 1 HALF BATHS, 3 CAR GARAGE AND EXTENDED ROOF/SCREENED-IN LANAI. GRANDE WESTON FLEX MODEL OVER-LOOKING A LAKE. FEATURES INCLUDE RAIN GUTTERS, SECURITY SYSTEM, IRRIGATION SYSTEM AND HURRICANE SHUTTERS. LOCATED IN THE DESIREABLE GATED COMMUNITY OF STONEYBROOK AT VENICE WHICH HAS A COMMUNITY CENTER, ACTIVITY DIRECTOR, FITNESS CENTER, LAGOON STYLE POOL, SPLASH FOUNTAIN, SPA, GAZEBO WITH GRILLS, MEDIA ROOM, IN-LINE SKATING. EASY ACCESS TO I75, MINUTES TO SHOPPING, BEACHES AND HISTORIC DOWNTOWN VENICE. Copyright © 2019 Mid Florida MLS. All rights reserved. The data relating to real estate for sale on this web site comes in part from the Internet Data Exchange Program of Mid Florida MLS. Information provided is for consumer's personal, non-commercial use and may not be used for any purpose other than to identify prospective properties consumers may be interested in purchasing. Bright Realty participates in the MFRMLS Internet Data Exchange (IDX) program, allowing display of other MFRMLS broker's listings on this site. However may not include all listings currently available. Information is deemed reliable but not guaranteed. Information last updated at 2019-04-25 00:00:37.